How do people react when you tell them you’re a writer? What did your friends and family say the first time you told them you were writing a book? Did you tell them right away or did you wait before you told them? Maybe this wasn’t a big deal for you at all, but for me it was, and it’s something that I’ve only recently been able to get over. Let me tell you my story (and why it took me six years to tell anyone I was a writer). I spent a lot of high school talking about writing and researching publishing but never writing a single word or doing anything I found out about online. Or ever telling anybody that I wanted to write my own book. In 2011, I decided to sign up for NaNoWriMo (National Novel Writing Month). I was 7 months pregnant, in my third year of college, and student teaching. It was now or never with the whole writing thing. Either I was going to give writing a real shot and finally write an actual book or give it up forever and focus on having a baby and getting through school. It wasn’t easy, but I crossed the 50K finish line. With that, writing became this true possibility for me, and I knew it was what I wanted to do. And I was going to do it. This was when I finally started taking writing seriously and learning all about self-publishing. Again, this was 2011. So I set that first novel aside because it was complete garbage and got to work on my first real book, a YA romance. It took me a couple years, but I finally hit publish on New Year’s Eve 2013. I wasn’t about to let 2013 end without becoming a published author. So I hit publish. I hit publish again with book two in fall 2014, about 9 months later. And again in summer 2015 with another book and a relaunch of the series. And now it’s 2017, and I have book 8 on pre-order. I’ve written two complete YA romance series at a pace of about two books a year, and I’ve just now “outed” myself as a writer to IRL friends and family. I’m just now comfortable calling myself a writer out loud. What’s funny is that a few of my family members did find out during the years in between because of my older sister who stalked me online. Then she found me online on social media (curse you Suggested Friends!) and told some other family members. So why was it so hard for me to say out loud to someone that I’m a writer? I’m just now comfortable with people knowing about that side of me. I won’t even talk about it that much to my husband. I might share when I finish writing a book or answer his question of how things are coming along, but It’s still hard for me to share too much. But I’ve gotten over most of the fear associated with telling people what I do. I think it comes back to a crippling fear of failure and a fear of putting myself out there with these stories. It makes me feel really vulnerable to have people I know in real life, especially family, these stories that I’ve put my heart and soul into. Especially with my first couple of books, I poured a lot of myself in there, which is why this whole writing thing always felt like this super private and personal thing. My family and friends in real life know me in this certain way, and now they’re going to see and know me differently. Since this summer (2017), though, I finally started to feel ready to share this part of myself with people in real life. 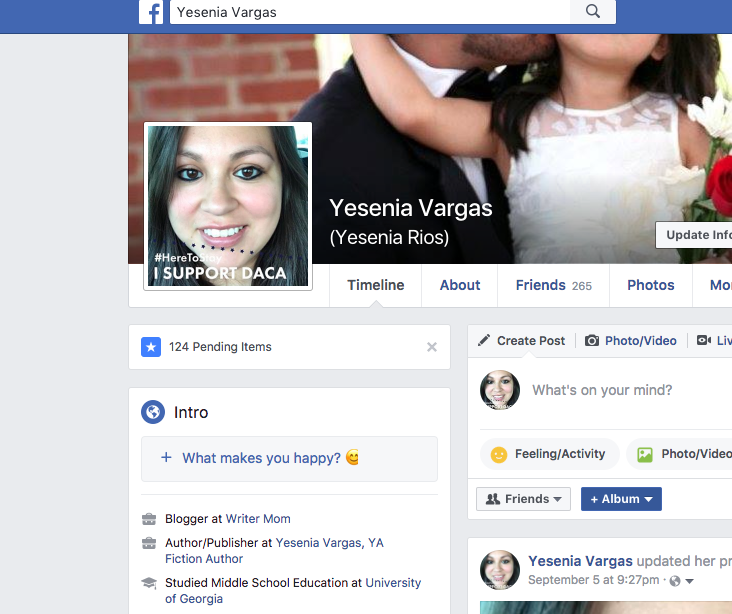 With my accountability group’s encouragement, I finally “outed” myself officially on Facebook about a month ago by publishing that I work at WriterMom and at Yesenia Vargas, YA fiction author (my Facebook pages). So now my friends and family know, although some of them already had a good idea. Posting it on Facebook was the first step. Telling people in person that I was a writer was my next step. And that was it. I hid the fact that I worked from home as an author and editor. I couldn’t bring myself to say it. Two or three weeks ago, though, I was out with some friends, and I asked the new friend across from me what she did for a living. And she said she worked for herself as a health coach. All of a sudden, it became easy to tell her that I worked for myself too. It felt like I had someone kind of like me, with their own business. So I opened up, and everyone else started asking about my books, and I showed them. It was the coolest thing ever. It’s not nearly as scary anymore. The reactions have only been extremely positive and supportive. I’ve even had someone come up and ask me to tell them more about how I do what I do because they want to write and publish their own book! Again, so cool. Their reactions have only helped me get over that fear of telling people I’m a writer. As scary as it is, if you’re in the same situation, it’s completely okay to take it a little bit at a time. Share your author social media profile or just tell 1-2 people who are already your biggest fans. Work up to posting it on Facebook. The next time you Introduce yourself to someone, say that you work for yourself online. Then say you’re a writer and then that you write and publish fiction books. Practice exactly how you’re going to say it. It’s so liberating to say it out loud to someone. You’re going to love it. Writing is such a huge part of who I am so I’m definitely happier now that people know and I’ve gotten over a lot of that fear. I’ll admit that telling people that I’m a writer will always be a tiny bit scary because publishing the stories inside my head is such a vulnerable act in and of itself. But it also makes me feel great about myself because it’s such a big part of my identity as a person. I’m really happy I did it. I’d love to hear your experience with telling people you’re a writer in the comments. Do your family and friends support you? Do they know you’re a writer?